I’m not much of a baker, never really have been. Before starting this blog, I think my baking was limited to cornbread or maybe dropping some ingredients into a bread machine. Occasionally, I’ll make my Mom’s banana nut bread. But cookies? Not so much. Cakes? Never. Pies? Not on your life. But this blog has pushed me to try new things, expand my horizons, and let me tell you…..it’s kind of fun. These dinner rolls aren’t difficult to make. They are super simple. In fact, you don’t even need a stand mixer or electric mixer. You can do it all by hand. And they are super cheap. I bet you have everything in your house right now to make these….well, maybe not the yeast. Depends on how much you bake. You know you want to try these. Dissolve yeast in 1/4 cup warm water. Allow mixture to sit for 5-10 minutes, giving the yeast time to do its thing. It should get all bubbly. Dissolve sugar in remaining 3/4 cup warm water. To the yeast mixture, add salt and oil. Slowly sift in flour and then add the sugar/water mixture. Turn out the dough onto a floured surface and knead for about 5 minutes until smooth and elastic. Add more flour to your surface if dough begins to stick. 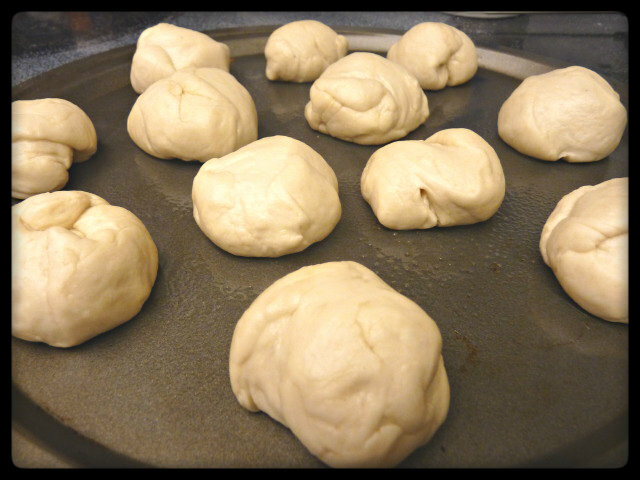 Flour hands, pinch off pieces of dough and roll in flour. Place on an ungreased baking sheet and bake at 400F for 15-20 minutes. If desired, brush rolls with melted butter after 10 minutes. 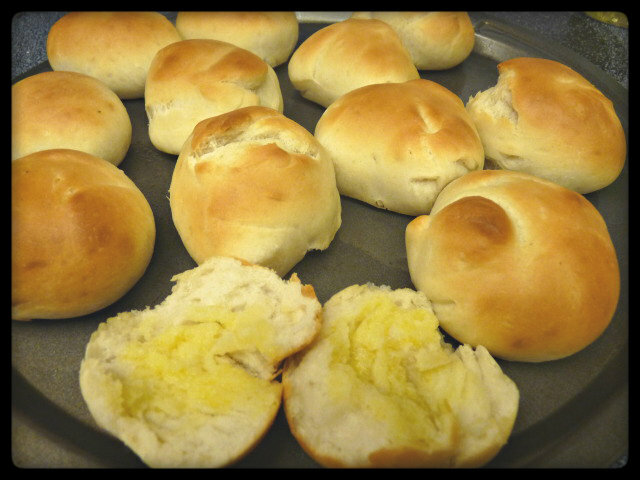 When rolls are done, slather with butter and serve with dinner…..if you can wait that long. I had to try one right away to see how it came out. Couldn’t wait one second longer. 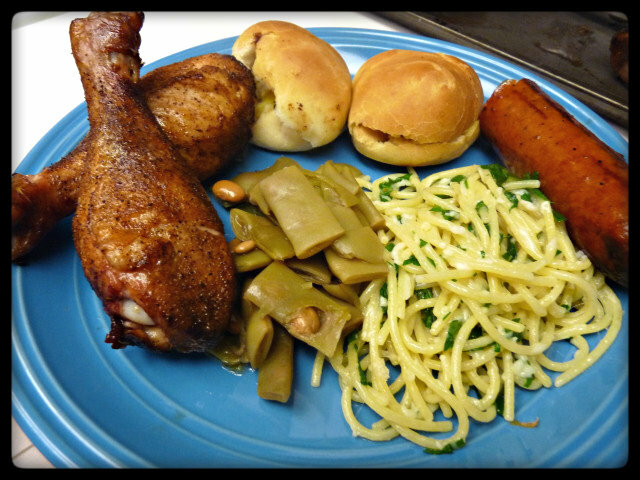 We served up the Simple Dinner Rolls with some Hanging Chicken Legs, a link of sausage, some home made pasta that Mrs. G whipped up (would you like the recipe for that?) and some green beans. Mrs. G isn’t a big fan of bread or rolls, but she took one bite and quickly put two on her plate, mumbling about how good they were. That in itself says something to me and made me smile. 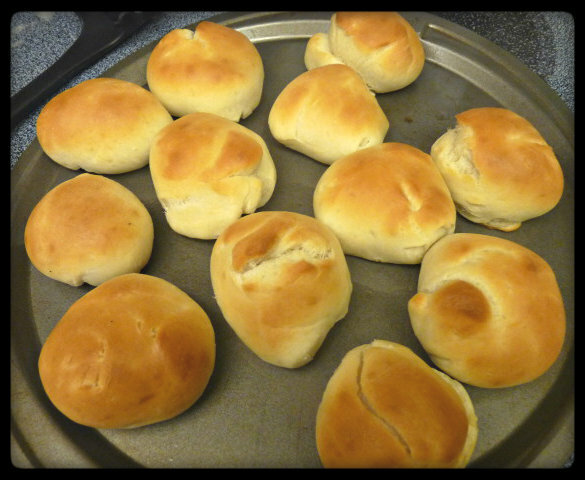 If you are hesitant to make your own rolls, I encourage you to try these. Super simple, super cheap, but the results are so worth it (and much better than store bought ones). Try them, your family will thank you for them. Nothing like freshly baked bread! You are so right, Anita. Love the way it makes the house smell as its cooking. I love the shot with the melted butter! Thank you very much. Fresh, hot bread is so much better with butter. I’ll tell Mrs. G to get on that for you. 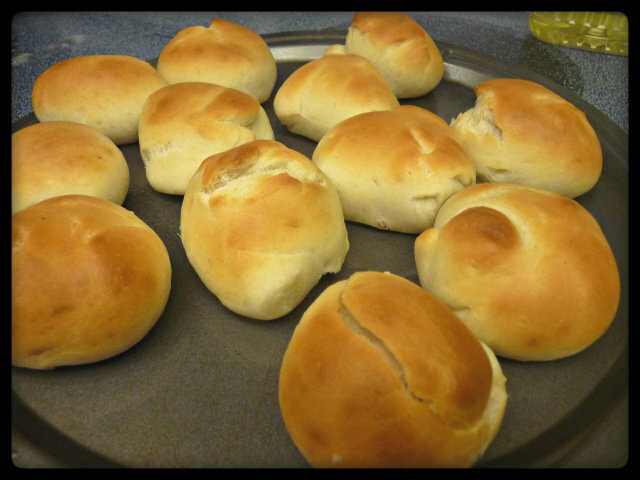 I made the rolls this evening. I discovered that one should not make rolls for the first time wearing black with black counter tops. I do not understand the kneading process. I had flour all over me, my counters and my dog. It looked like it snowed in my kitchen. They came out OK, but I think I need practice. What is the deal with 2 kinds of yeast (active and highly active)? I put one of each in water and used the one that produced the most bubbles. I really do not know what I am doing. Do you think I should use my kitchen aide mixer to do the kneading? Thought of you this evening when I saw on the news that Andy Williams had passed. Do you remember Ed and Gloria Hicks that lived down the street from you? Well, when Ed had his 50th, Gloria gave him a surprise party at the County Club and had Andy Williams as the entertainment. It was a great party. That brought me to remember Halloween. I remember I was horrified to learn that you guys hit the neighbors, including the Hicks the day after Halloween for left over trick or treats. Evidently, Gloria Hicks loaded you guys up. You made out like bandits as people wanted to get rid of temptation. I felt that I had to act shocked and stop the plunder, but I was totally impressed with the originality of the idea, and it worked. You guys stockpiled at least a years worth of sweets. Hey CC Mom. I’m not sure about the two kinds of yeast, not sure I’ve ever seen highly active. I believe I used active, but can go back and check to make sure. You could always use your mixer for the kneading, I didn’t feel like going to the laundry room to dig it out and then have to wash it up later. I have read some excellent stuff here. Certainly price bookmarking for revisiting. I surprise how a lot effort you put to make such a fantastic informative site. I don’t even understand how I finished up right here, but I believed this publish was great. I don’t understand who you might be but certainly you are going to a well-known blogger if you happen to are not already. Cheers!